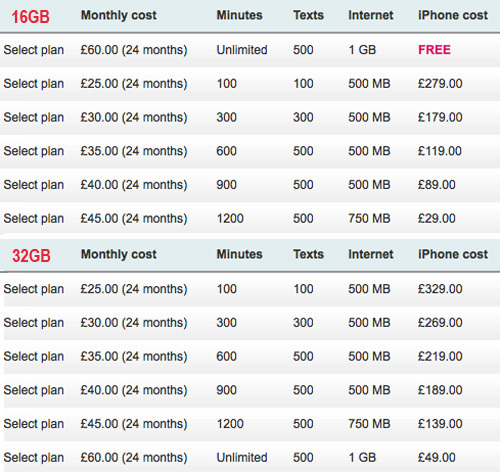 Last month, we reported T-Mobile UK's price-plans for the iPhone 4. Today the telco start shipping the iphone, and has come in with lower tariffs . T-Mobile UK starts pumping out the iPhone 4 to customers, along with lower tariffs than originally planned. With the most tariffs, the handset is £50 cheaper than first announced. OK, T-Mobile is still one of the costlier options when getting an iPhone 4, but it's a step in the right direction. Swimming against the trend, is the £25 monthly contract, which sees the handset cost increase by £20. Don't let yourself get phone jacked over pricing, compare the market, we've updated our tables (again) ®.